The Trijicon RX30 has a large, 42 mm objective to maximize light gathering and speed target acquisition. It draws its daylight illumination from a fiber optic element and automatically adjusts to ambient light. Night illumination is tritium – no batteries are required. The aiming pattern is a 6.5 MoA amber dot which is easily acquired and centered on the target. 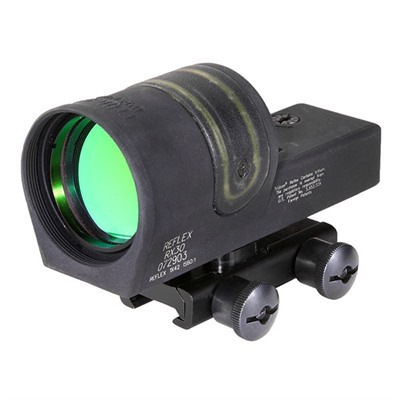 The Trijicon RX30 is designed for both-eyes-open shooting for maximum situational awareness. Multi-layer coating is used on the dichroic mirror coated lens for the best possible light transmission. Total adjustment range in both windage and elevation is +/-30 MOA. Adjustments are 1″@ 100 yard clicks. The housing is A357-T6 aluminum alloy, investment cast to provide immense strength and hard anodized in a matte dark gray finish. Check the price of the Trijicon RX30 at Brownells, a name you can trust. Full disclosure: If you purchase from Brownells I will receive a small commission. This will help keep this site online and will not affect your purchase price. Thank you!